It is widely accepted that the American Shorthair found it’s way to the new world in much the same way as the colonists did, on board the ships that sailed 3000 miles across the ocean, filled with those seeking a new life away from the empires of Europe. The breed was likely kept on board to kill vermin as they made their voyage, and once they arrived a large number of these cats found themselves in America. The original strong and hardy breed provided the exceptional stock from which the American Shorthair breed began. As the birth of the United States and all of it’s subsequent history unfolded, the breed spread just as the people did, becoming known by the start of the 20th century as the domestic shorthair. The domestic shorthair found it’s way to dozens of cat exhibits and thousands of homes across the country, becoming the number one breed in the United States at the time. Subsequent decades saw many more breeds of domesticated shorthair cats arriving in the United States, and so in 1966 they were taken in by a number of dedicated breeders who renamed the domestic shorthair as the American Shorthair. 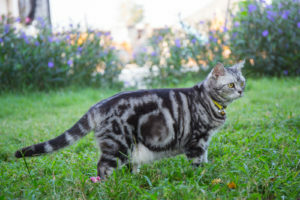 The breed was then further developed into the American Shorthair we see today, having since 1966 and it’s re-naming been placed in shows across the country, gaining recognition among fanciers. It remains one of the most prevalent breeds in the continental United States. To this day still, American Shorthairs retain many of their hunting instincts and strong characteristics from their ancestors who made the journey across the Atlantic. The breed must now follow a very strict set of breeding regulations as it is now recognized by The International Cat Association (TICA), so we are unlikely to see any changes from this breed or it’s place in homes across America any time soon.